​and across the pond in Europe!! 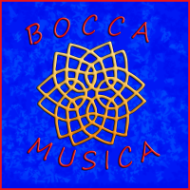 ​ALL materials contained on this website, including, but not limited to, graphics, names, music, & site design are copyrighted by Bocca Musica..
Any use of the materials on this site must be preceded by the expressed written consent of Bocca Musica..
HEY, it's not nice to steal!! !